When you think about LINE-X, you probably picture a tough, spray-on bed liner that is designed to protect the bed of a truck from rust, scratches, and even chemical spills. That isn’t all that LINE-X is good for, though. The LINE-X formula is versatile enough that it can be applied to almost any surface on your truck or your SUV. At R.P.M. 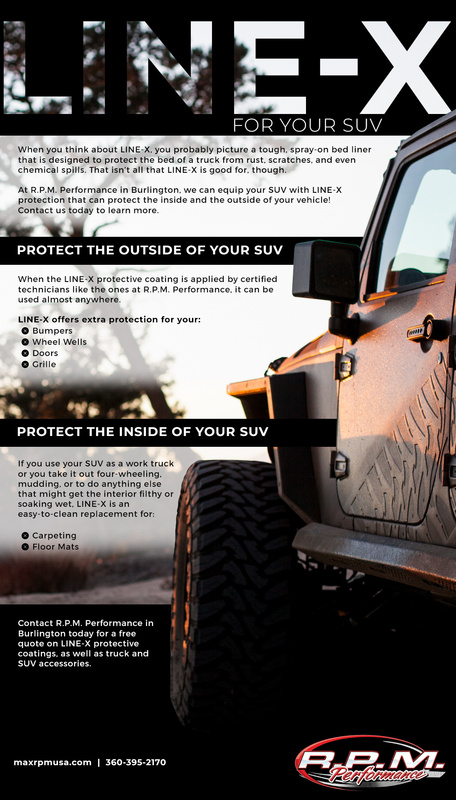 Performance in Burlington, we can equip your SUV with LINE-X coatings that can protect the inside and the outside of your vehicle! Contact us today for a free quote on any of the SUV accessories and LINE-X coatings that you need in order to transform your SUV into something truly special. R.P.M. Performance is also a full collision repair center, and we can install everything from winches and running boards to new suspension systems and lift kits. When the LINE-X protective coating is applied by certified technicians like the ones at R.P.M. Performance, it can be used almost anywhere. Our techs have years of experience, as well as specialized training, that teaches them the proper way to apply LINE-X to almost any surface. When you choose R.P.M. 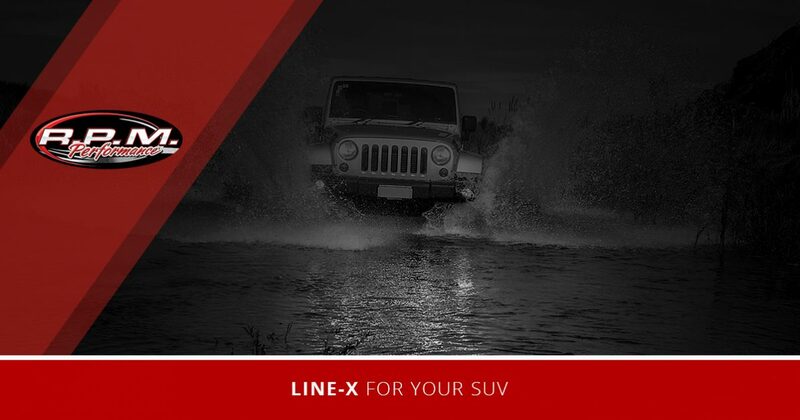 Performance for your protective coatings, they will be covered by the LINE-X lifetime warranty. If the coating ever bubbles, peels, or cracks, we (or any other authorized LINE-X dealer) will fix it for free. While most people think that only trucks require this much protection, SUVs need this protection, too, especially if you drive in conditions that would normally damage your paint, including thick forests or areas with other natural obstructions. LINE-X works as an excellent replacement for paint on any area that could be scratched or dented. The LINE-X coating is completely waterproof, which makes cleaning it as simple as spraying it with a hose. Instead of having to have the interior of your SUV detailed every time it gets muddy or wet, replace the carpet and floor mats now and see how much easier it is to keep the interior of your SUV looking great for years to come. Contact R.P.M. Performance in Burlington today for a free quote on LINE-X protective coatings, as well as truck and SUV accessories. We are proud to help people find exactly what they need, so no matter what your idea is, get in touch with us. In addition to having the largest selection of SUV and truck accessories in the area, we also provide some of the best collision repair services, custom paint, tunes, and window tinting available. We also have wheels, tires, and new brake systems that we can install on your vehicle.